Combat Veteran Coaches Therapists In Best Ways To Help Vets At Risk Of Suicide : Shots - Health News The VA is now training counselors in how to better understand and bring up guns and gun safety without alienating clients who are combat veterans. 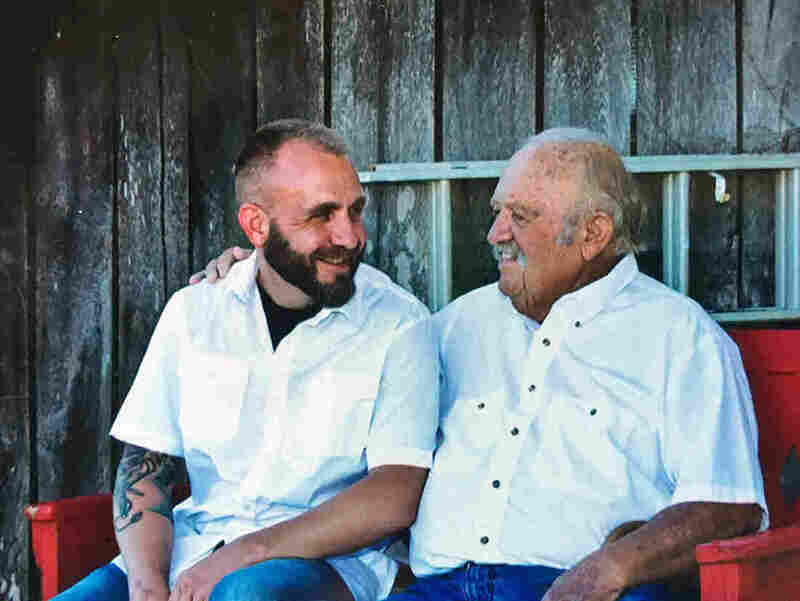 Jay Zimmerman (left) and his father, Buddy, in July 2016. Buddy, who was also a veteran, passed away last September. "Growing up in Appalachia, you look forward to getting your first firearm," he said, "probably more so than your first car." His grandfather taught him to hunt squirrels and quail. Zimmerman, who lives in Elizabethton, Tenn., said pretty much everyone he knows has a gun. It's just part of the culture. "When I went into the military, that culture was reinforced," he said. "Your weapon is almost another appendage. It's part of who you are." Zimmerman served as a medic in the Army in the late 1990s and early 2000s. He served in Bosnia, Africa, and the Middle East. Since he came home, he's struggled with PTSD and depression. It reached a crisis point a few years ago, when his best friend — the guy who had saved his life in a combat zone — killed himself. Zimmerman decided his time was up, too. "I decided that I would have one more birthday with my daughter, one more Christmas with my daughter," he said. "I had devised my own exit strategy for 16 February, 2013." But then he bumped into a woman who used to ride the same school bus when they were kids. His exit date came and went. They're married now. Zimmerman still gets depressed, but now he's a peer counselor at the Mountain Home VA Medical Center in Johnson City, Tenn. He also travels to conferences all over the country, sharing his story with therapists and with other vets, encouraging them to ask for help when they need it. Even today, he explains at these conferences, if he's not doing well, he disassembles his guns and stores them separately from ammunition, so he can't make any rash decisions. And if things get really bad, Zimmerman has a special arrangement with a few friends. "I call them and say, 'Look, I'm feeling like it's not safe for me to have firearms in my home. Can you store them for me for a couple days till I feel like I'm OK to have them back?' "
Suicide is often an impulsive act. Nearly half the people who survive an attempt say the time between their first thought of suicide and the attempt itself was less than 10 minutes. But the method can mean the difference between life and death: People who take pills have time to change their minds, or may still be alive when discovered. That's not the case with guns. But here's the trouble: Most therapists aren't gun people. They don't know how to talk about guns and so they don't. "One obvious reason for that is that no one has taught them how," explained Megan McCarthy, a psychologist and National Deputy Director in the Office for Suicide Prevention in the U.S. Department of Veterans Affairs. "How many of you would say you feel really comfortable having a conversation with any of the people you work with about limiting access to all lethal means?" she asked the roomful of therapists. "OK, so that's why we're here today," she said. "We often conceive of ourselves as experts — as people who impart information to clients," she said. But with vets, "it may take time to build trust. Telling them what to do the first time you've met them is probably not going to be a very effective approach." He didn't do it. A week later, the man told his psychiatrist things were still tense with his girlfriend. But he didn't want to talk about suicide or storing his gun. McCarthy asked the clinicians in the audience what they would do next, if they were this man's psychiatrist. "Why did he not do it? That would be my question," one therapist said. "I would want to see this individual again, within the same week," said another. "I believe in strong intervention." "Chances are the reason he's not talking to you is because he's afraid he's going to lose his gun that he carries pretty much all the time," Zimmerman said. "My buddies are the same way. We all carry — all the time."